In the last 100 years, Christmas was a warm and regenerative family holiday for many Norwegian-Americans. It was celebrated with family feasts of lutefisk, lefse, rømmegrøt, fattigmann and fruktsuppe. Trees in such homes were decorated with straw ornaments, flags, and heart-shaped baskets.To ensure good luck in the coming year, the hidden nisser in the barn were fed porridge. However, as time passed and families move farther apart, many of these traditions are being lost, but not really forgotten. For those who want to recapture the Norwegian-American Christmases of the past but can’t remember some customs or recipes, this book by Kathleen Stokker, professor of Norwegian at Luther College in Decorah, IA, is an important tool to help pass on family traditions. 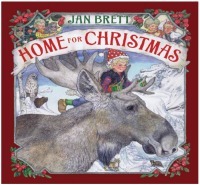 Detailed with historical facts and tracing the commercial emphases in both Norway and America, and with accounts of ancient and modern Christmases, photographs and recipes, Keeping Christmas reminds Norwegians and Norwegian-Americans of their connections to each other, but also explains how the celebrations in both countries differ. Does anyone else remember julebukking?